A man who claimed that eating marijuana candy led him to shoot his wife to death in their Observatory Park home pleaded guilty Friday to second-degree murder, ending a years-long debate surrounding pot and its possible influence on the slaying. Richard Kirk, 50, agreed to serve 25 to 30 years in prison as part of his plea, and to relinquish custody of his three children. 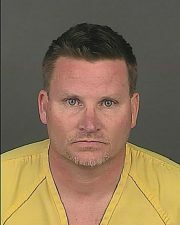 Kirk killed his terrified wife, Kristine, as she pleaded with a Denver 911 operator for help, saying over a 13-minute phone call April 14, 2014, that her husband was ranting about the end of the world and asking her to kill him. Kirk is set to be sentenced April 7. As part of the plea, Kirk also will serve five years of parole after his release from prison. His children will be adopted by Kristine Kirk’s parents, Marti and Wayne Kohnke. Just weeks before his trial on first-degree murder charge was scheduled to begin in 2015, Kirk’s attorneys changed his plea from not guilty to not guilty by reason of insanity, citing marijuana intoxication. That trial was delayed because a judge had ordered a mental-health evaluation to determine whether Kirk was competent to stand trial. Kirk was set to face a trial next month, which has now been vacated. Prosecutors dropped the first-degree murder charge, which could have landed Kirk behind bars for the rest of his life. Kirk, who was dressed in a gray jail jumpsuit Friday, was stooped and appeared to have aged dramatically since initial charges were filed. His hair was almost all gray. Unprecedented edibles lawsuit: Is this the first wrongful death lawsuit against the legal marijuana industry? Weed news and interviews: Get podcasts of or Watch The Cannabist Show. “We have reached a disposition,” prosecutor Helen Morgan told Denver District Judge Martin Egelhoff. Egelhoff asked Kirk a series of questions, probing to see whether he was mentally fit to plead guilty. Kirk itemized a long list of medications he is taking for anxiety, sleep deprivation, high cholesterol and depression. He stood at a lectern and answered Egelhoff’s questions with a series of “yes” answers, acknowledging the trial rights he was giving up by pleading guilty. Kirk had purchased and partially consumed marijuana-infused candy before killing his wife while the couple’s three sons were in the home. Before the shooting, Kristine Kirk called 911 to ask for help. She said she was scared of her husband, who was ranting and jumping in and out of windows, according to previous reports. Kristine Kirk told the 911 operator her husband was “talking about the end of the world and he wanted her to shoot him,” according to a probable cause statement. She also told the operator there was a gun in the house, but that it was kept in a safe. Before police arrived, Kristine screamed over the phone until a single shot was fired. Police have said officers had almost reached the home when the shooting happened. A partially eaten “Karma Kandy Orange Ginger” candy was found at Kirk’s home after the shooting. The candy — which was about the size of a Tootsie Roll — contained 10 servings of THC, with each serving containing about 10 milligrams. Prosecutors had rejected any arguments that Kirk was not acting intentionally. They claimed the financial and emotional strain of his marriage contributed to a conscious decision to kill his wife. McCann said part of the reason the family did not want to have a trial was the impact it could have on Kirk’s three children. Their youngest son, who was 7 at the time, watched his mother die, according to court records.